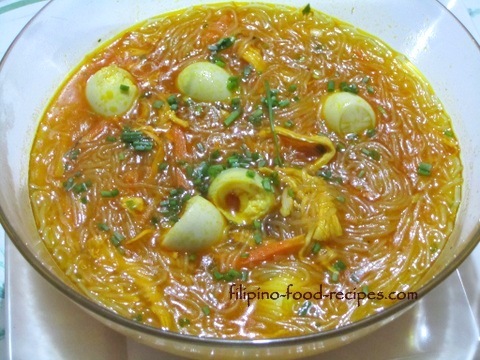 This Sotanghon soup recipe is a simple chicken noodle soup using cellophane noodles or sotanghon. Most sotanghon dish, whether soup or sauteed, usually come in reddish/orange hue, that is why achuete seeds and sotanghon commonly come together. This is rather easy to prepare, just sauté some garlic and onion in atsuete oil, add the boiled chicken flakes, broth and carrots(or any other vegetable of your choice), and lastly, the quail eggs, which are a sure kids' favorite! So comforting, we love and enjoy it during rainy days and cold nights. 1 Soak the sotanghon noodles in tap water for 10 minutes. 2 Heat up the achuete seeds in oil for 3 minutes, then discard the seeds. 3 Saute the garlic and onion in the oil, then add the the chicken, fish sauce and carrots. 4 Add the chicken stock or Knorr cubes in water, and bring to a boil. 5 Drain the noodles and add to the soup. 6 Simmer until the noodles are cooked, about 3 to 5 minutes. 7 Add the boiled eggs, season with salt(if needed) and pepper. 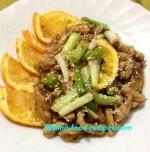 8 Top with sliced green onion and serve hot.